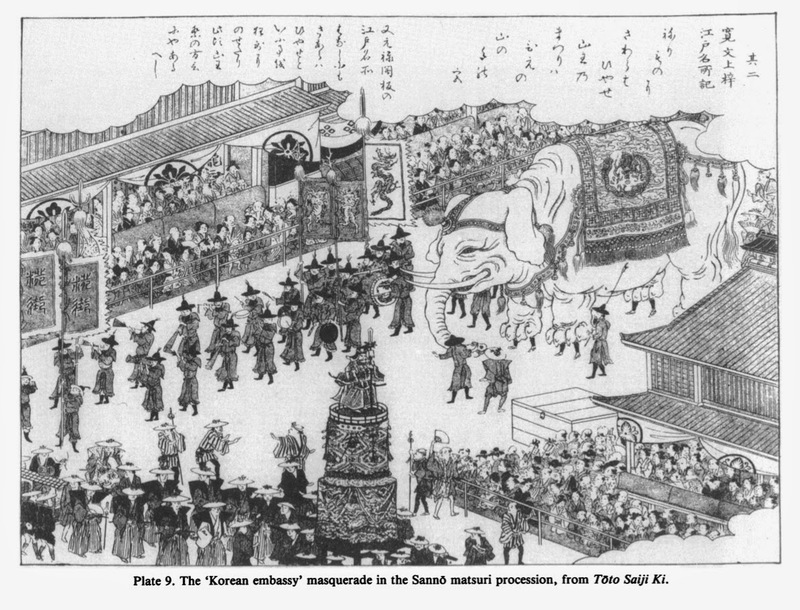 Korea’s cultural output was very popular among all classes of Japanese society and this sweeping cultural demand outweighed diplomatic achievements. Yoshimune’s character is dauntless, superior and wise, and this year, he is thirty-five years old. He is of strudy spirit and his (sic) a diginified bearing. He is a lover of the martial arts but finds no joy in literature. He respects economy and rejects extravagance. Ordinarily he says, “Japanese think highly of Korean letters. But the style is unique for each. Although we study it, since we cannot become skillful, for us, it is best to write in Japanese. When the Korean ambassador comes to Japan, there are ceremonies to display our military might and to provide music, but these have no meaning, either. The military is the way to defend ourselves, but if they see it and it scares them, we lose the meaning of our desire for contact, or if they despise it we have not achieved out (sic) scheme of displaying force. When it comes to musical skills, we have our mutual customs. Why should foreign music gladden the ear; what is the purpose of this ceremony? In the way of friendly relations, value lies in sincerity. They are men from a faraway land, do not delay them. We must see them home pleased. We shall pare away and remove all extreme rhetorical flourishes and details,” and so forth. When practicing governance, he puts honesty and humility first. He aids the poor and reduces their taxes. Those who commit capital crimes have their noses severed instead of being executed. All sing his praises. When one of his minsters entered his presence dressed in brocades, Yoshimune immediately asked him the cost of the gown, and said, “Even the cotton robe I have on is sufficient to cover the body.” Thereafter it is said that not one of his ministers wore brocades. …the Hayashi house has presided over letters in Japan. Generally speaking, all those who practice literature with the state as their patron, come from this house. Those who have been recommended as students and draw a salary are several tens of people. However, when viewed, the (product) is clumsy and simple and does not succeed (in having) a style. Since all Japanese offices are hereditary, even if there is a scholar of high caliber and profound learning, without studying under Nobuatsu [Hayashi], he will not find a position. The situation is laughable. The rules which were brought at daybreak, were not only written in Japanese kana, but were also written in grass writing and not at all clear. According to the magistrate, Amenomori Akira was bed-ridden with illness and there was no one who could interpret the document, no one who could translate it into Chinese. The envoys said that with unclear rules of protocol, they could not present the communication. They dispatched a fast messenger to summon Matsuura Tadashi, but he said it would be difficult to write it on the spur of the moment and declined. Japanese literature is, in the main, written carelessly, is blurred, muddled, and unskillfully copied. Accordingly, everyone expressed disapproval. Before I move on to the next article, I would like to point out that James B. Lewis wrote a book entitled Frontier Contact Between Choson Korea and Tokugawa Japan which, from what I can tell, has a richness of complementary information regarding the same subject matter described above, complete with demographic statistics, pictures and other interesting details related to the Korean envoys to Japan in the early modern era. That book is in my possession and I hope to read it one day, if not in its entirety, then at least a couple of chapters that could add some new information to the topic of early Korean-Japanese contact. The depiction of embassies, particularly Korean ones, by the turn of the eighteenth century had become a major thematic genre in every medium of Japanese art. Not only did courtiers, the bakufu, and daimyo commission paintings to record the embassies, but artists and print shops churned out dozens of versions of prints and pamphlets with Korean embassies as their subjects, suggesting an eager and ready market. Nishijin silks, already the finest in all Japan [and] were decorated lavishly with dragons and phoenixes, lions and unicorns, all embroidered and appliquéd in gold thread. The most astounding aspect of these festivals was the ability of the common folk to gain the viewership of the shogun himself, something that not even samurai of higher social rank could obtain easily. As a result, members of the lower class were given the rare opportunity to escape the rigid strictures of Edo-period social division and to assert equality and even moral superiority over members of higher status. 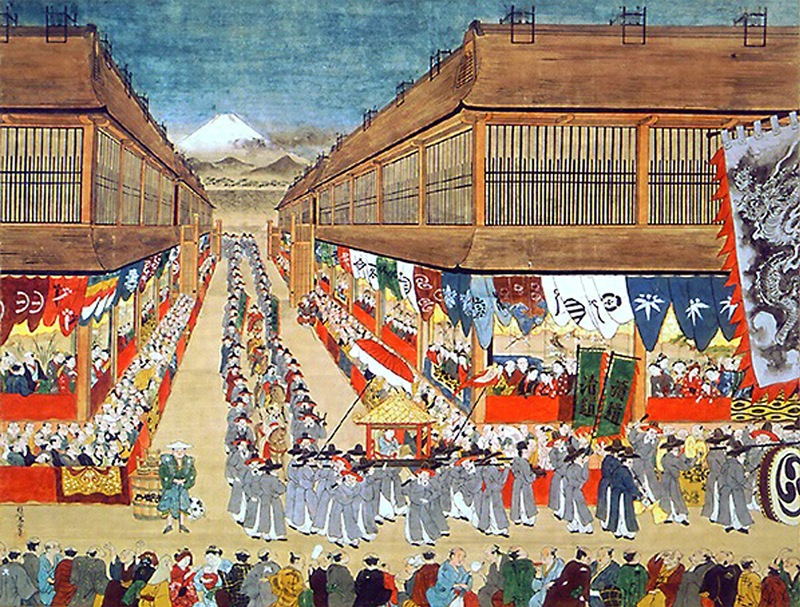 In the Meiji period, these festivals were discontinued because they were seen as remnants and reminders of the Tokugawa Shogunate and its link to a past where peasants could step outside their social class. Korean embassies had become part of the fabric of national consciousness, helping ordinary people articulate the very nature of their world, and their own place in it. Korean embassies, that is, had, by the Genroku period, become part of the universal vocabulary of contemporary Japanese art and popular culture, part of the landscape of the mind of artist, celebrant, and viewer alike. Lewis, James B. "„Beyond Sakoku: The Korean Envoy to Edo and the 1719 Diary of Shin Yu-han.”." Korea Journal 25 (1985): 22-41. Toby, Ronald P. "Carnival of the Aliens. Korean Embassies in Edo-Period Art and Popular Culture." Monumenta Nipponica (1986): 415-456. The pictures used here all come from Toby's article. So the picture at the top would be one of the Tōjin gyōretsu? Or is it the real thing, as it were? There seem to be large Japanese-style drums at the head, with that particular tri-swirl pattern that I associate with Japan, not Korea. I'd sort of like to know which it is.